By night, he’s a giraffe. Skye and I took him down the street, and he was so happy to be out there, seeing the jack-o-lanterns and decorations and especially that mailbox that lit up and howled. 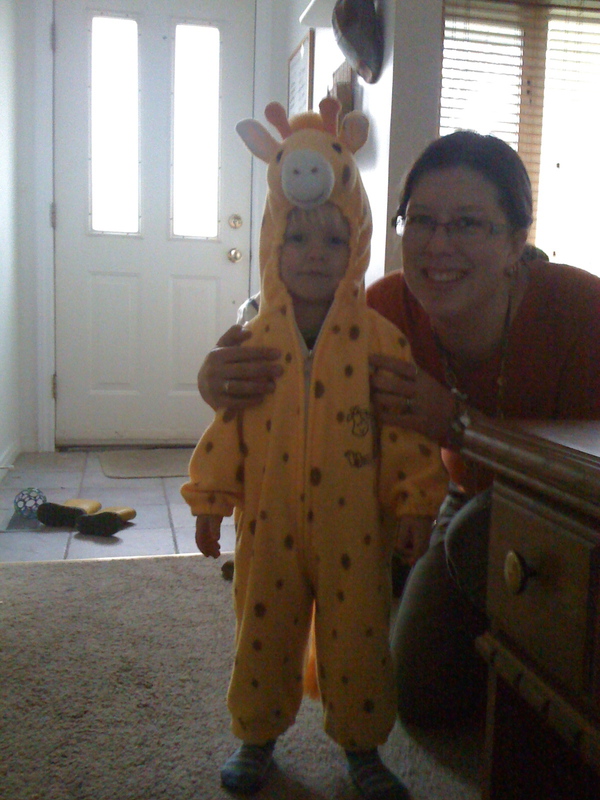 He said “Trick or treat!” like a pro, and everyone smiled at our tiny, chatty little giraffe. When I would remind him, “What do you say?” in hopes of a thank-you, he had decided that “Happy Halloween!” was the appropriate response. It was SO. CUTE. He would have kept going, if we hadn’t magically arrived at our own house. 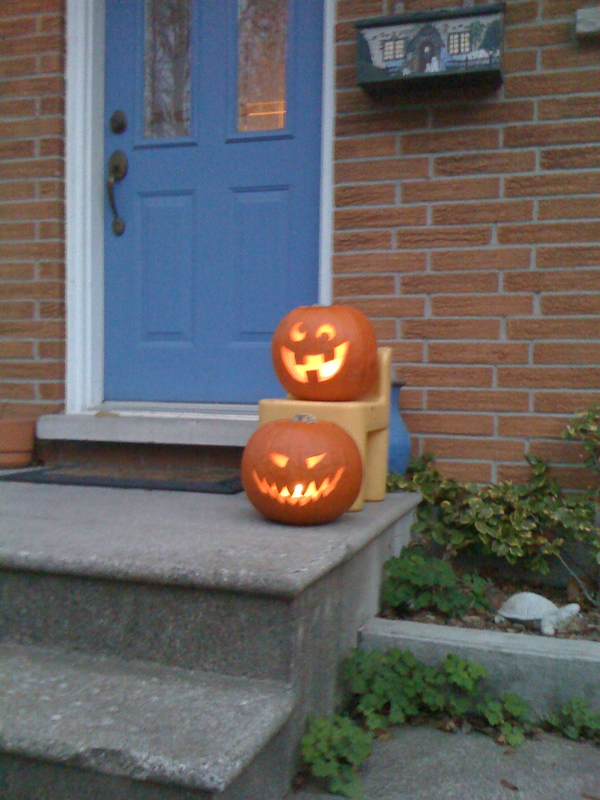 We got around 30 trick-or-treaters – more than last year, if I remember right! Yay. I also made these funny things (thanks for the cool idea, Accustomed Chaos!) – vegetarian filling with brown rice, soy beef, corn, salsa, cheese, and seasoning. 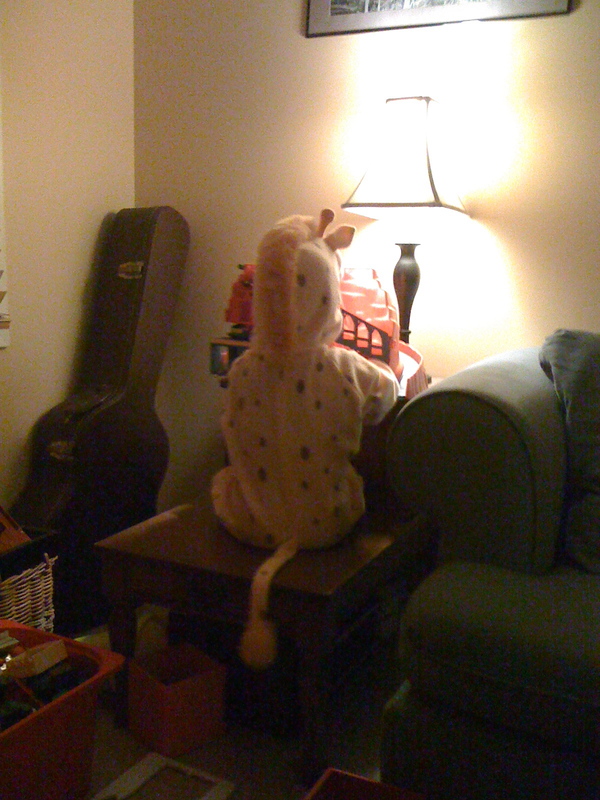 As you can imagine, our wee giraffe did not feel much like going to bed. Man, I love that kid. Now I remember why Halloween is fun. Where do you get all these cool costumes? Geez, our homemade ones from your childhood (and mine, for that matter) aren’t in the same class. Yeah, he’s cute, all right! I’ve noticed it myself. 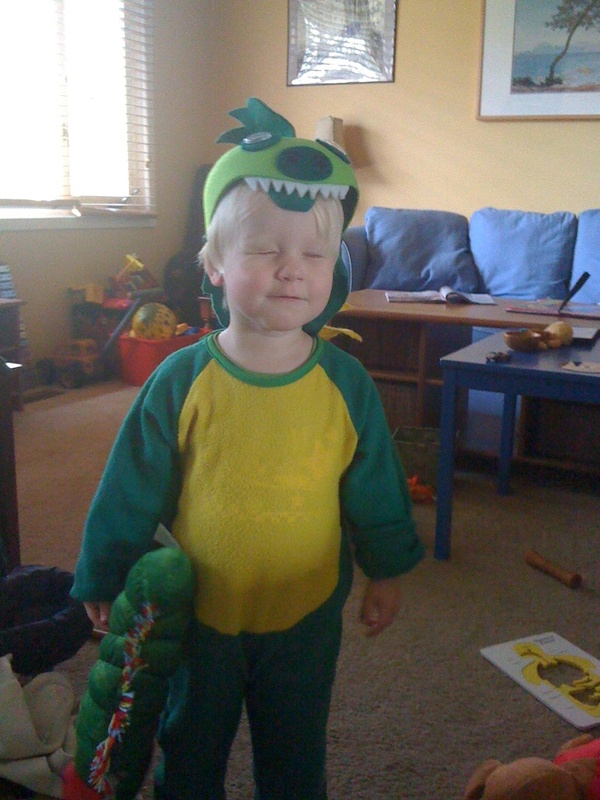 Actually, I KNOW where the dragon hat came from: doting great-auntie. And I suppose there are just some conveniently green pajamas or the like…? Actually, they’re all hand-me-downs! It’s still true: we never pay for anything around here. My friends with little boys just purge in my direction. i love the last picture with his tail hanging over the edge. we hid from Hallowe’en this year. couldn’t do it. guess we missed all the cuties around here. does E know that giraffes are silent and that they can clean their nostrils with their tongues??? OMG. I’m so glad you linked to this page. WOW, E and AB look just alike in their giraffe pics! It’s fun to get a lil time warp back to then. Such a cute dragon, such a cute giraffe-on-table. 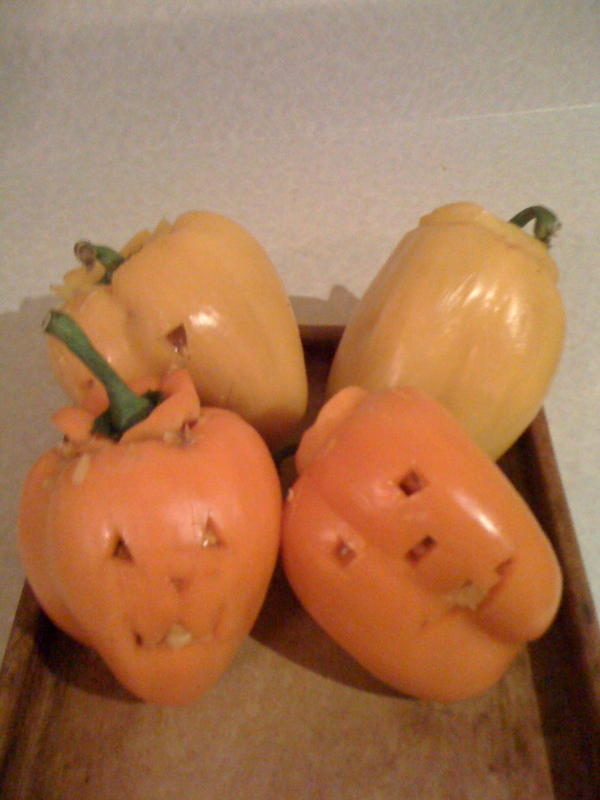 And I remember those peppers! I had to stay late at York doing stuff for my prof, and missed out on halloween, but you saved me a scary stuffed pepper and it was soooo delicious. And I think this was the year that then we did a big kitchen-floor-covered-in-newsprint card for Dylan’s birthday, and E was talking about halloween and the smokey houses. I have footage.